Luxury mid-top elevator sneakers with upper in black full-grain leather and sole in natural rubber. 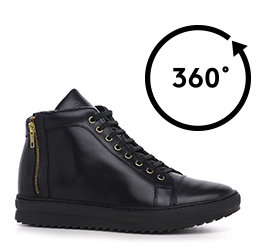 The side zip and the golden eyelets give a trendy touch to match with jeans or slim fit trousers. A chic and casual sneaker with inner elevator system able to increase height from 2 (5 cm) up to 2.75 inches (7 cm).